This week we are talking body acne. You are likely to have a skin-care routine for your face and neck however what about your chest, shoulders or back? Most of us don’t show nearly the same amount of TLC for our body as we do for our face, resulting in blemishes. According to the Health Grove Organisation 2015 survey, unwanted body acne peaks for both girls and boys from ages 15 – 19. Today we are going to assist you with eight of our top tips to combat body acne; in particular bacne (back acne) and chestne (chest acne). Washing and bathing are some of the best ways of maintaining good hygiene and protecting yourself from infections, illnesses and ailments. If you think your skin needs a deeper clean, the Original Proactiv Deep Cleansing Wash (which has recently been reformulated) contains 2.5% Salicylic Acid to clear and help prevent blemishes all over your body. It contains gentle botanicals that help remove dead skin cells that can clog your pores, leaving your skin feeling soft with a healthy-looking glow. 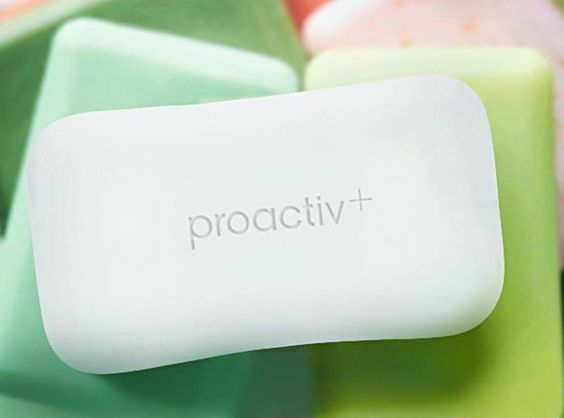 For those of you that prefer washing with a bar of soap, the Proactiv+ Cleansing Body Bar is a great alternative. This soap-free bar is derived from coconut oil and contains gentle exfoliating beads that clean pores; plus this deep-cleansing, exfoliating, lather-rich bar fights face and all-over body blemishes! Loved by beauty heaven who awarded it a 5/5 star review! A good scrub in the shower is a must-do and essential for encouraging skin renewal whilst resurfacing and refreshing your skin cells. Proactiv+ Skin Smoothing Exfoliator is a double duty cleanser. First, for breakouts, it contains 2.5% micro-crystal benzoyl peroxide that works to clear existing blemishes whilst preventing new breakouts from forming. For skincare, tiny exfoliating beads and glycolic acid help to unclog pores, loosen dull skin, and helps the skin appear smoother, softer, pore-less and more radiant. Skin is left feeling clean and hydrated, not dry and stripped. The Proactiv+ Skin Smoothing Exfoliator formulated with glycolic acid is a great choice to help revitalise dull skin and remove impurities, leaving you with a softer, smoother complexion. We all cleanse and moisturise our face regularly but how many of us take that down to our neck, or even our chest? There are many reasons people can get chestne, however clogged sebum and sweat glands can often be the causes of it, especially if you wear a lot of perfume. The skin on these areas is quite thin and can age much faster than the skin on the rest of our body. Our chest needs regular moisturising as it is exposed to the sun regularly, and is prone to becoming damaged and dry. Give the Proactiv+ Complexion Perfecting Hydrator a try. With rich botanicals and anti-ageing benefits such as even skin tone, smooth texture, smaller appearing pores and increased hydration, your skin can maintain a dewy, radiant glow. Our back is the number one area we often neglect. After all, out of sight, out of mind, right? Your back can be subjected to a lot of different products, such as shampoo and conditioner residue, or sun cream. Plus the friction of your clothing rubbing against your back during the day forces a combo of surface sweat, dirt and oils back into the pores, which clog them. This would make anyone want to cover up, so it’s essential to invest in an exfoliating brush, like the Proactiv Deep Cleansing Brush, and make sure you exfoliate your back regularly. Also ensure that you fully wash off any shampoo and conditioner you have used. We recommend using an anti-dandruff shampoo, which also has bacteria-fighting properties that will leave your scalp squeaky clean and back, backne free! Multi-colour, fitted active wear may be the latest fashion trend, however the accumulation of trapped sweat, friction and heat isn’t great for your skin. The combination of all three clogs your pores and invites bacteria to grow. To prevent breakouts, invest in active wearthat is loose and made of breathable fabrics such as cotton or linen. Cotton in particular soaks up all the sweat and oil produced on your body, trapping it in your clothes instead of in your pores and spurring those inflamed pesky bumps. After hitting a hard gym session it’s crucial to change out of any sweaty clothes and shower ASAP to prevent any bacteria remaining on your body developing into breakouts. If you can’t rinse off immediately, change and then wipe down your body, particularly the chest and shoulders with a damp cloth until you can. Healthy skin is hydrated skin. Water helps your skin with its natural moisturising, keeps your energy up and boosts your metabolism. Your skin is the largest organ in your body. Like other organs, it needs plenty of water to stay hydrated and functioning on a healthy level. Many doctors recommend that you drink between 9 and 12 cups of water per day (2.2 to 3 litres), depending on whether you are a girl or guy. If you don’t eat well it will show up in your skin. Your whole body needs vitamins and minerals and the best way to get them is through lots of fresh fruit and veggies, lean meat and healthy fats. Eating too many heavy carbohydrates and processed sugar will leave you, and your skin, feeling flat and dull. Well, that’s it from us this week! We hope we have helped zap any unwanted pimples away and from interrupting your weekend! Next week we will be discussing how to control unwanted HSC stress and blemishes!